Multiple sightings of a lone woman fleeing a pale-colored sport utility vehicle were reported by survivors in Northeastern Coweta County. The woman ran in a southeast direction and through a large abandoned pasture and appeared to be in distress. 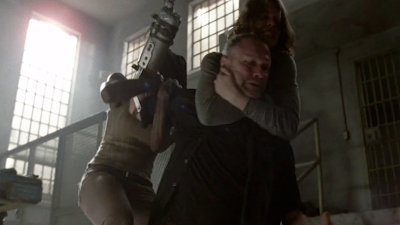 The survivors did make an attempt to offer assistance, but were unable to attract her attention and had to abandon their efforts. We would like to take a moment to commend the Coweta County Group for their courage and selflessness. During times of great strife, it is all too easy to become detached and refuse aid to those in need. We would do well to remember to foster a sense of community within ourselves and band together. There is great safety in numbers and if local communities and indeed the entire nation and planet hope to rebuild, then it will take the efforts of each and every one of us. 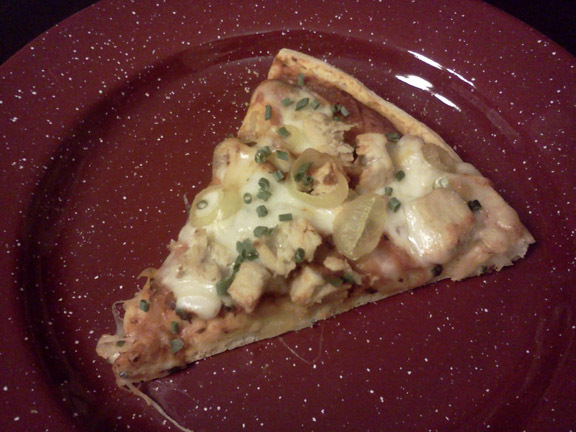 At this time, the WDSCB would like to present Mop Sauce Chicken Pizza. Mop Sauce was the sauce that was "mopped" onto the meat by cooks with a real string mop during the White House Barbecue for President Lyndon Johnson. The sauce is reproduced here using all pantry ingredients and provides the base for a delicious pizza with chicken, spicy peppers, cheese and chives. Your group will appreciate this unique departure from traditional pizza. Preheat oven to 375°F. Alternately, heat campfire coals to red-hot and allow coals to cover with white ash. Grease a baking pan or jelly roll pan or a cast iron skillet with oil or shortening. If you wish, sprinkle with cornmeal and rotate pan until the surface is evenly coated with cornmeal. For the Sauce: In a very heavy saucepan or Dutch oven, combine apple sauce, tomatoes, tomato paste and vinegar. Stir gently until combined. Stir in all the seasonings and blend well. Place on stovetop over medium heat or over campfire (medium-hot coals). Bring to a boil, stirring frequently. After the mixture comes to a boil, stir constantly for 3 minutes and then remove from heat. For the Crust: In a large bowl, combine baking mix and garlic. Stir in 3/4 cup of hot water and blend until a moist dough forms. If needed, add the additional 1/4 cup water. Sprinkle a clean, flat surface with a few tablespoons of baking mix. Turn out dough onto surface and knead gently 5 or six times until dough's surface is smooth. Place dough onto prepared pan and pat out into a 12 to 14 inch circle. 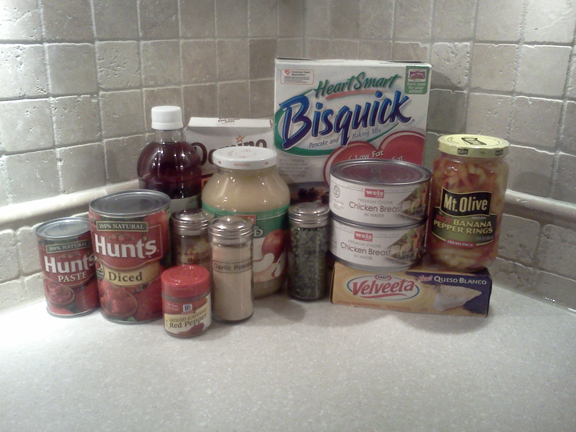 Top with 1/2 cup to 3/4 cup of sauce mix and spread sauce to within 2 inches of edge of crust. Top with sliced cheese, diced chicken and slices of pepper rings. Sprinkle with chives. 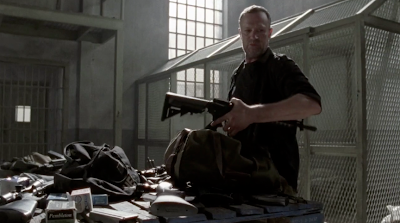 At the prison, Merle warns the Group that they will not survive an open war against The Governor. Although they are good fighters, they are not killers at heart. 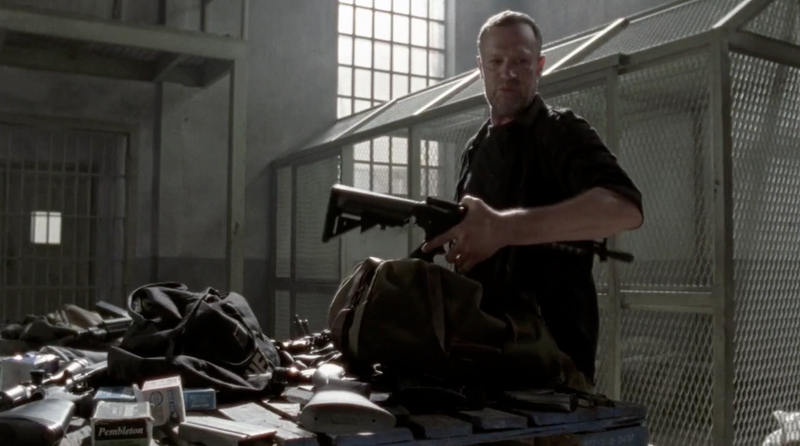 Merle's only desire is to protect Daryl, but he believes if they don't strike first, The Governor will win and destroy them all. Glenn refuses to let Merle go on an attack run to the feed mill, and a brawl breaks out between the two men. Maggie and Michonne jump into the fight but it is an enraged Beth that finally ends it with a single gunshot fired into the air. Rick, Daryl and Hershel return with the news that they are indeed at war. Rick does not share the full story; that their survival may depend on betraying Michonne. 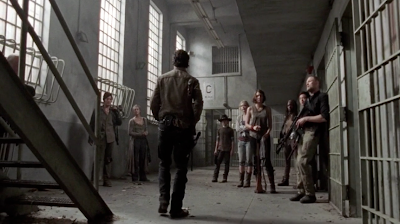 He wants the Group to be afraid. And to be willing to fight. Just as things seem to improve, new hardships always arise. The only constant they have is each other. The only comfort comes in knowing they will face this danger together and not alone. 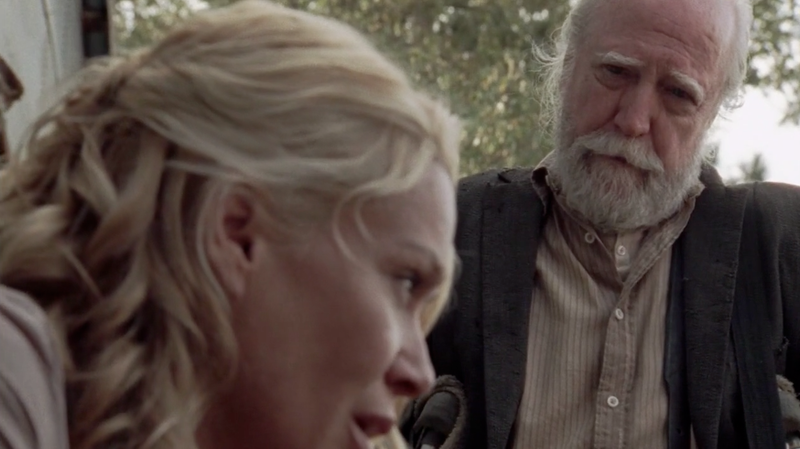 As the evening ends, they all gather a final time for a sweet surprise made by Glenn and Maggie. 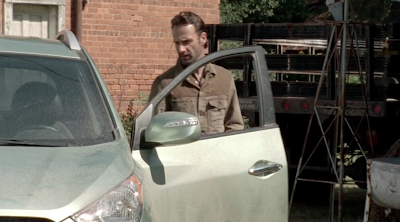 Knowing that their task would have been difficult, the two would want to have something sweet waiting for Rick and the others. 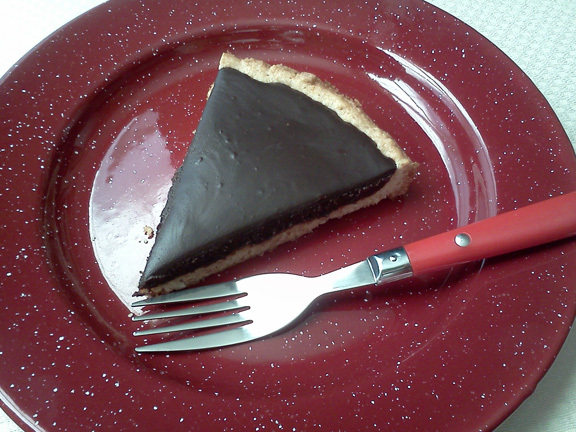 Sacher Tart is easy to assemble (from 8 ingredients) and tastes like it came from a fine bakery. Inspired by the Sacher Torte, made famous by the Hotel Sacher of Vienna, this tart will please everyone who appreciates chocolate. And even some of those that don't! 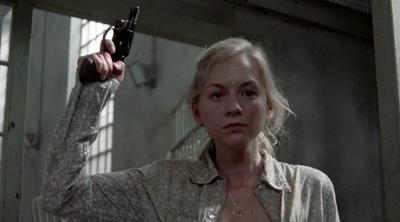 And when the dead rise; don't piss off Beth. *if the almonds you scavenge are stale; you can refresh them by toasting lightly in a pan over medium-hot coals. Preheat oven to 350°F. Alternately, heat campfire coals to medium hot. For Crust: In a large mixing bowl, combine baking mix, sugar and almonds. Blend in the shortening using a fork. Blend until the mixture appears to look like fine crumbs. Stir in water and mix well. Using clean hands, press mixture on the bottom and up 1 inch of the sides of a 9 inch pie pan or cake pan. Bake in preheated oven for 20 minutes. Do not allow crust to bake until brown. Brush with melted Apricot preserves and allow to cool to room temperature. Alternately, cover pie pan and crust with a baking sheet or wrap tightly in aluminum foil. Place over medium-hot campfire coals and allow to "bake" for 10 minutes. Uncover and check crust. Rotate pie-pan and rewrap. Allow to bake for an additional 5 to 7 minutes. Brush with melted preserves and allow to cool to room temperature. For Filling: In a heavy saucepan or Dutch oven, combine chocolate and evaporated milk over medium heat, or medium-hot campfire coals. Stir often until chocolate is melted. Do not allow to boil. Remove from heat and stir in Amaretto. Blend well. Allow to cool to just slightly warmer than room temperature. 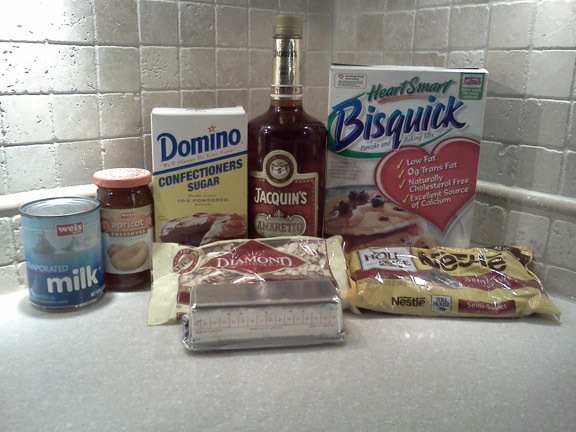 To Assemble: Pour mixture into cooled crust and set in a cool, dry place to firm. Allow pie to cool to room temperature. Cut into slices and serve immediately. 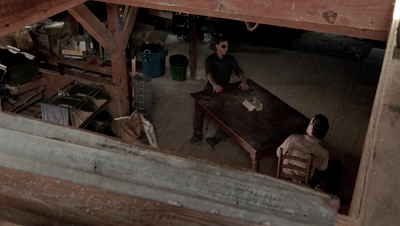 In an attempt to broker a peace between the Prison Group and Woodbury; Rick, Hershel and Daryl arrive at an abandoned feed mill to talk with The Governor. 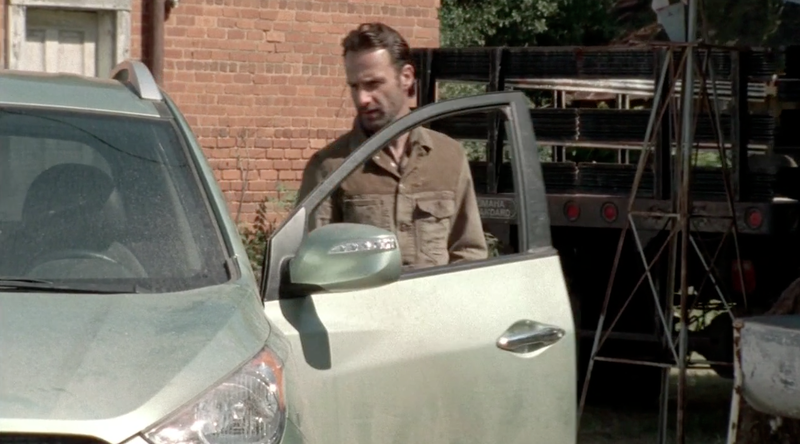 Although it was Andrea who arranged the meeting, she is quickly dismissed by the The Governor and thrown out. 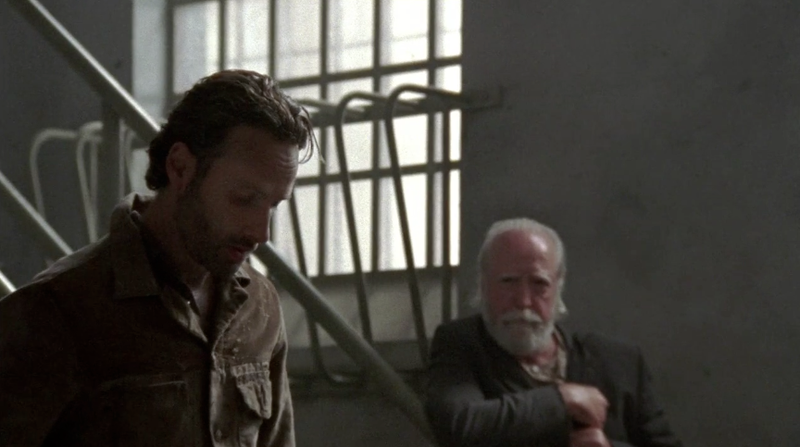 Hershel tries his best to comfort Andrea and reminds her that she is family and belongs with Rick's Group. 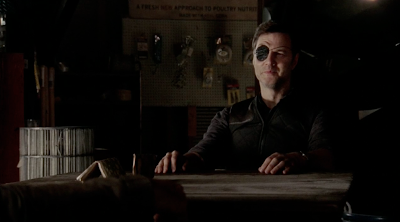 The negotiations deteriorate as The Governor informs Rick of his one and only demand…Michonne. 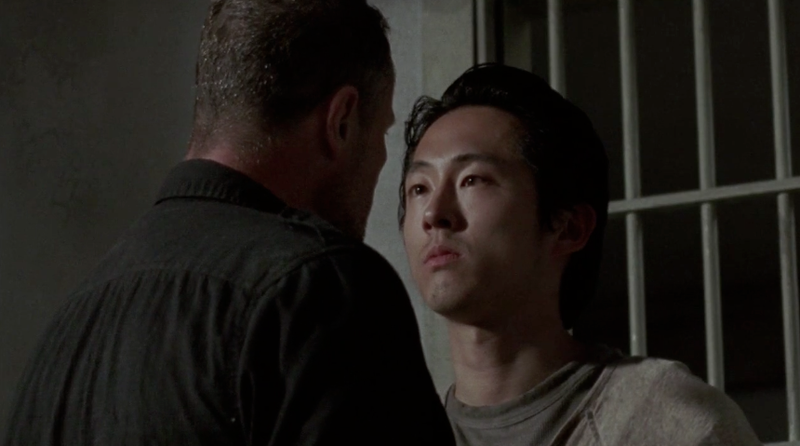 He will leave the Prison Group alone if they hand over Michonne. Rick questions The Governor's single-minded thinking and the negotiations come to an abrupt end. On the uncomfortable drive back to the prison, Hershel would insist on unwrapping the lunch that Beth had packed for them. 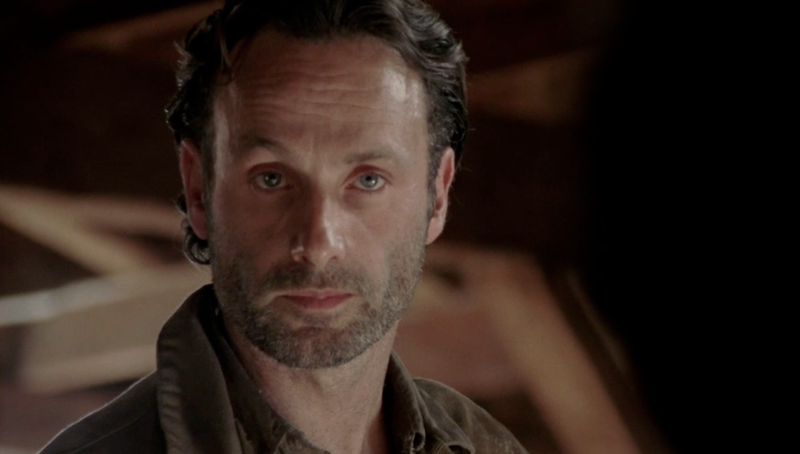 A victory against The Governor would mean nothing if they died from malnourishment. 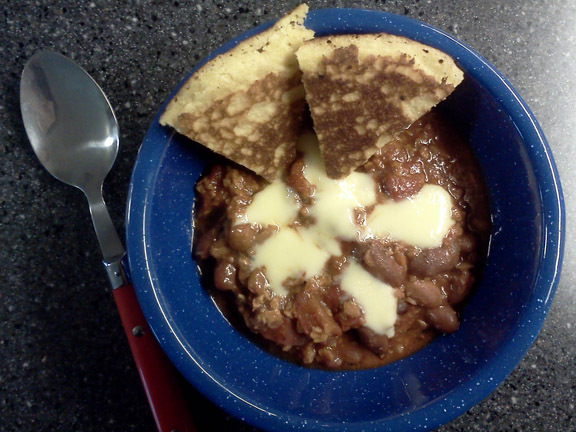 Red Chili is a hearty and nutritious meal and packs a protein punch thanks to the use of TVP. Corn Cakes make the meal a complete protein and round out the flavors. 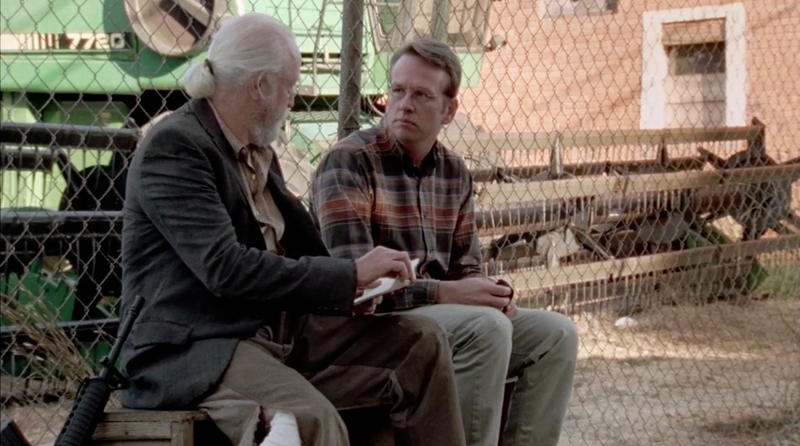 And when the dead rise; remember…it's impolite to ask legless strangers to show you their stump. For the Red Chili: Heat the stock or broth and minced, dried onion in a large Dutch oven over medium heat or coals. Stir in the TVP all and once and mix well. Warm gently until TVP swells and softens, stirring frequently to avoid scorching. Stir in all the spices, both cans of tomatoes and enchilada sauce and the drained beans. Stir well and allow mixture to come to a boil. Simmer very gently and stir frequently to avoid scorching. Taste and add Kosher Salt and Pepper to taste. 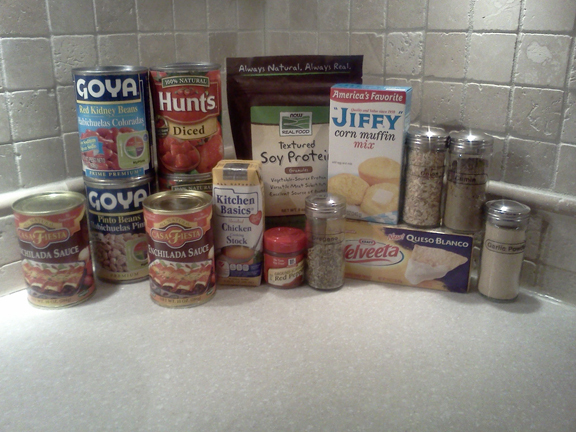 If you like your chili spicy add an additional 1/4 tsp Cayenne Pepper or to taste. For the Corncakes: Prepare Corn Muffin Mix according to package directions (omitting egg), and add an additional 1/4 cup of water. Heat 1 Tbsp of oil or butter flavored shortening in a large, cast iron skillet over medium heat or medium coals. Drop corn cake batter into hot shortening with a 1/4 cup measuring cup to form cakes. Spread batter if necessary. Cook for 2 minutes or until small bubbles form in the batter. Using a spatula, flip corn cakes over and cook for an additional 2 minutes. Serve with Red Chili.